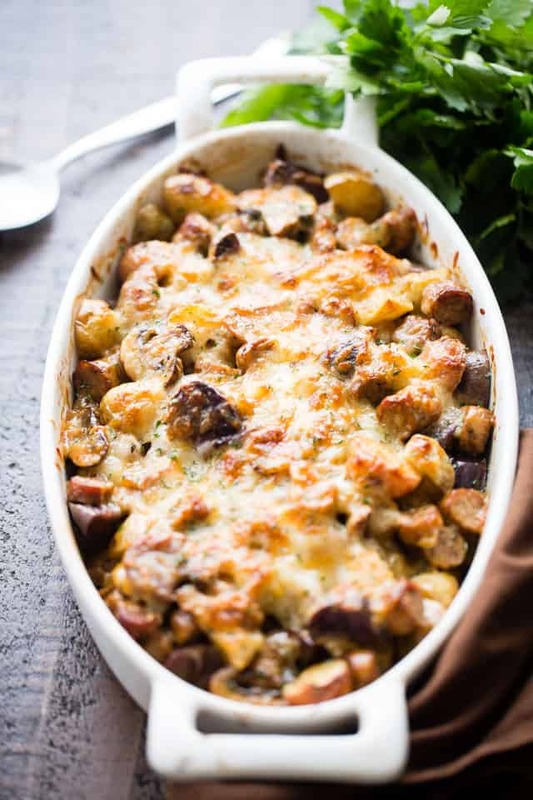 This Cheesy Potato Gratin with Turkey Sausage and Mushrooms is an amazing side dish with potatoes, turkey sausage, and mushrooms. The cheese on top takes it OVER the top! OMG! 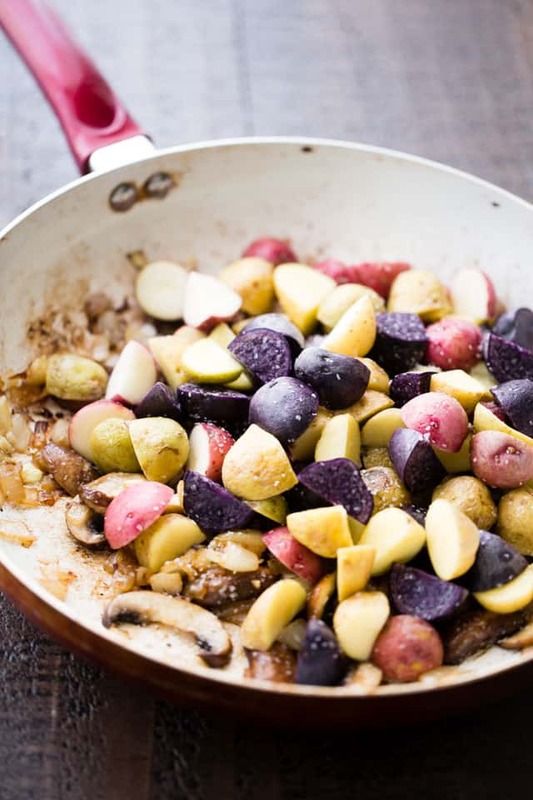 Have I got a potato side-dish for your Easter lunch! Or do you do Easter dinner? We do lunch. Mid-day, maybe around 3ish. Cannot WAIT! One word about this potato gratin? Ok, 3 words? must.have.now. right now. Would you believe that this side dish is sort of on the right side of healthy? It is! There’s no cream, no eggs, no butter… yes, there’s cheese, but we gotta give in somewhere, right?!? Please say RIGHT! One more thing about that; my taste-tester, A.K.A. my mom, told me that I should call it deconstructed moussaka. Macedonian moussaka is a casserole with layers of potatoes and ground beef. I say call it what you will, but make sure you make it because it’s crazy good! I made this potato gratin because it’s loaded with mushrooms and meat, and those are great things to have on your plate, or in your life. We start this dish by sauteeing everything, first. 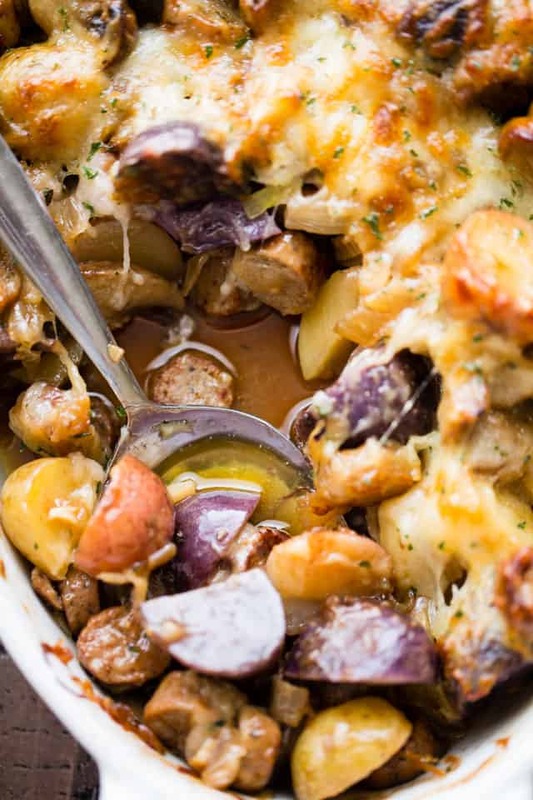 There’s onions, garlic, mushrooms, turkey sausage, and of course, potatoes. All that goes into a skillet and is cooked until everything is softened-up a bit. The mixture is then transferred to a pretty oval baking dish, it’s topped with cheese, and baked for 45 minutes, or until browned and bubbly. Don’t be afraid of the liquid up there – it’s just chicken broth, not oil. Now please go and bake it until bubbly, scoop it onto a plate, top with more cheese, and devour. 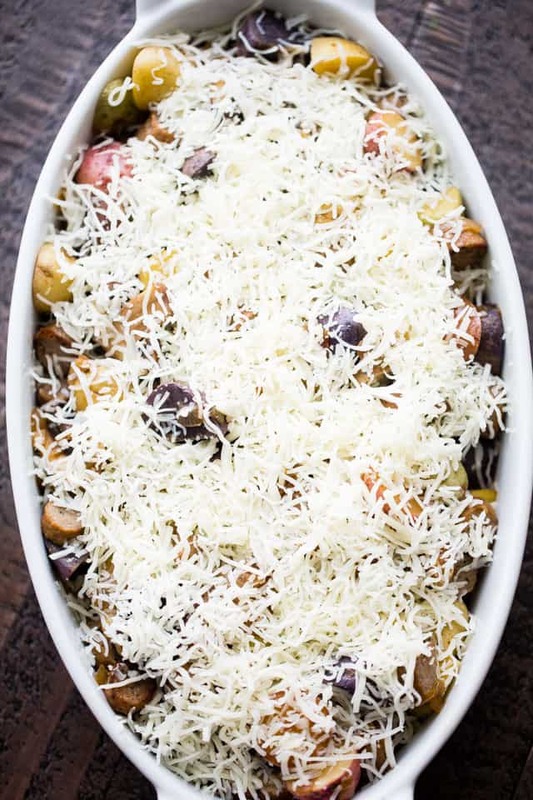 An amazing side dish with potatoes, turkey sausage, and mushrooms baked to a delicious perfection. The cheese on top takes it OVER the top! 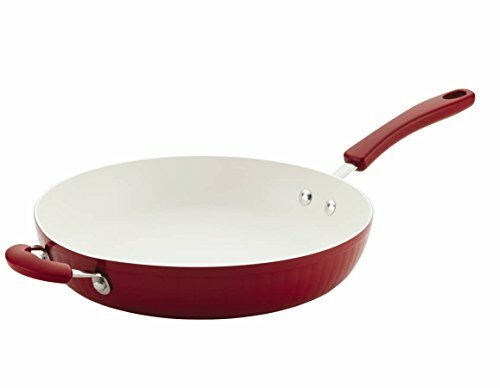 Grease a 2-quart baking dish with cooking spray and set aside. Heat half tablespoon olive oil in a large nonstick skillet over medium-high heat. Add turkey sausage to the skillet and cook for 4 to 5 minutes, or until browned. Remove sausage from pan, drain, and set aside. Return skillet to heat and add remaining olive oil. Stir in mushrooms and garlic and continue to cook for 5 to 6 minutes, or until mushrooms are soft. Add potatoes, thyme, salt and pepper; cook for 5 minutes or until potatoes have browned. Stir in sausage and broth and remove from heat. Transfer the mixture to previously prepared baking dish. Top with cheese and cover. Remove aluminum foil and continue to cook for 12 to 15 minutes, or until golden brown. 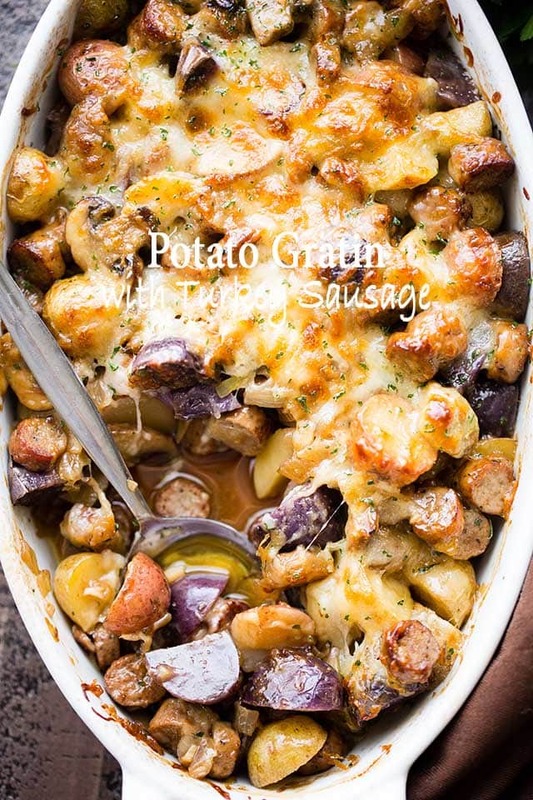 Adapted from "Cooking Light: All Time Top Rated Recipes"
Nice recipe, even after Easter, love the potein-sausage boost and the other flavors in this and don’t miss the cream, etc., thank you for this recipe! I bet this disappears SO fast. It looks amazing! Oh, wow! This looks amazingly delicious! Such a perfect side dish! Looks delicious but Did you really use only half a cup of cheese? This looks like a wonderful dish to try. Cheese is always good! I could make this a dinner with a salad! This looks like a total sunday comfort food dinner! Loving all the cheese! 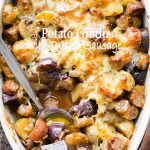 Gratin or casserole…..I just call it delicious!! I’m thinking this dish would be a great meal for us – love comfort food!